One of the most spectacular scenes in the trailers for The Force Awakens was seeing the Millennium Falcon flying into the engine of a crashed Star Destroyer, chased by TIE Fighters. 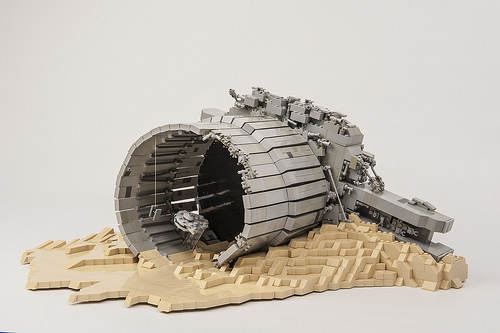 Simon Pickard has recreated this iconic scene in LEGO, with the maw of the engine about to swallow the Falcon and its pursuing TIE Fighter. The chunk of tan desert landscape surrounding the grey engine complements the scene beautifully, with a bit of sand spilling into the engine.